Oxford. The very name conjures up images of distinguished academics strolling through halls steeped in centuries of tradition. 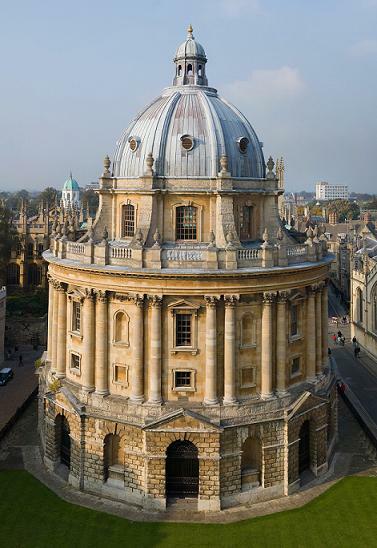 I always knew Oxford University as the oldest university in the world (actually, it's the oldest university in the English-speaking world), and it is the elitest of the elite, the standard to which every other university is compared. 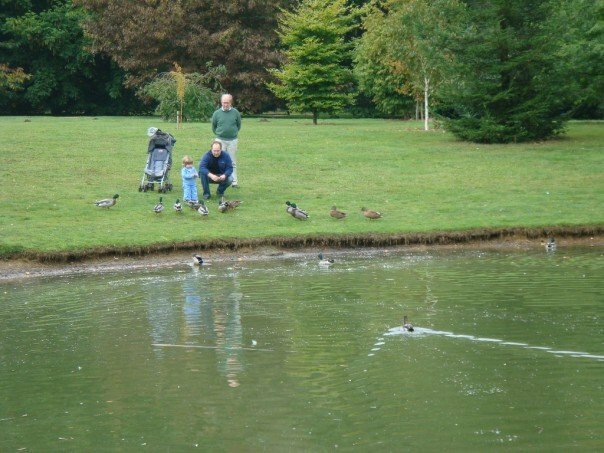 With such a prestigious and prominent reputation, and being only a short bus ride away from London, a visit to Oxford was definitely in order! Last weekend, I traveled with two classmates to Oxford. We stayed for one night. We left Friday morning, because none of us have class on Fridays (what a great schedule!). 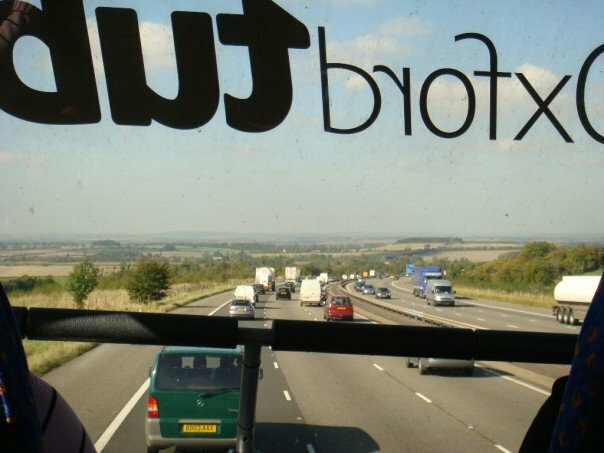 We took the Oxford Tube bus, which runs regularly every day between London and Oxford. We bought tickets for our bus right there, no need to order online, and we were soon on our way to Oxford. The bus ride took only about an hour and a half, and most of that time was spent just getting out of London. After leaving the city, though, the scenery turned beautiful: Rolling English countryside, with hints of autumn just beginning to show on the trees. The bus was a double-decker, and we sat at the very front of the second level, which gave us the best views on the bus. 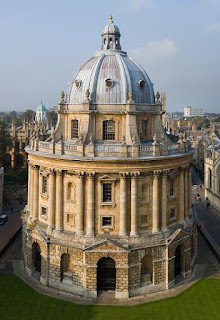 As the bus entered Oxford, it passed by several of the university buildings directly on the street. I was struck by the medieval architecture. The buildings really seemed like they were built in the 13th century. I could tell that I wasn't in London anymore. The bus pulled into the bus station, right in the centre of town. Julia, Mikenna, and I grabbed our stuff and headed straight for the hostel. Our hostel was the Oxford Backpackers, a funky and colorful place to stay. There were no keys, either; instead you have to enter a combination of numbers to unlock the door. The bathrooms were alright--brightly colored with metal decorations, a cross between an industrial artist space and a kindergarten classroom, but nothing unusual for a hostel. Yet I prefer the Castle Rock Hostel in Edinburgh. After checking in to our hostel, the three of us set off to explore Oxford. We walked into the center of town, passing by busy crowds of locals and tourists. 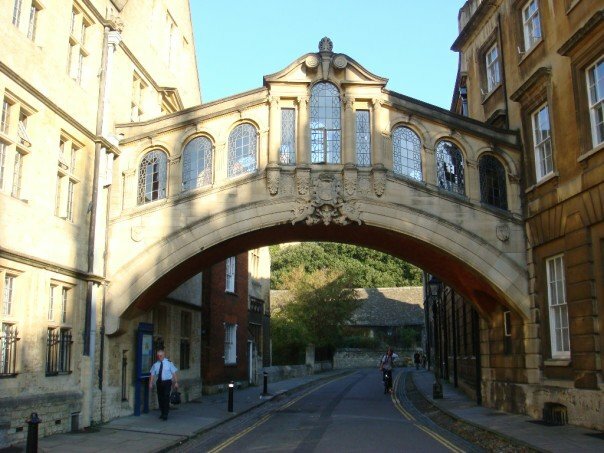 The University of Oxford is actually comprised of many (over 40) semi-independent colleges. I was surprised to discover that visitors are not allowed into any of the buildings! There's one college that gives tours of its interiors for £10. Great, but no deal! So we satisfied ourselves with walking around the town and admiring the university buildings from the outside. We passed Christ Church College, famous for being a filming location for the Harry Potter movies. We walked past more colleges and to the other side of town, glancing inside a few shops and cafes along the way. We ended up at the River Cherwell, one of the two rivers flowing though Oxford (the other being the Thames). There were some people punting along the river on this peaceful afternoon. We walked over the bridge, the Magdalen Bridge, to just see what was there. A few shops and some houses, but nothing too noteworthy, so we turned around and returned into town. We saw some more university buildings, but not being allowed inside any of them soured the experience for me, and the buildings of each college all seemed the same. There were also plenty of other tourists roaming the grounds of the university. We found an old church and went inside, taking a few minutes to rest and reflect. Then, we headed to the main shopping street, Cornmarket Street, a pedestrian-only zone with shops and stores and a more European feel. The girls wanted to find Primark (a store famous in the UK for its cheap yet fashionable clothes), which we found inside the adjacent shopping mall, and they shopped frantically, as the store was about to close. They got their shopping done; I got a chance to sit around and rest. We then continued walking back towards our hostel. We stopped by Oxford Castle to at least see the entranceway. We didn't see much. There was a hill, apparently the site of the castle (or part of it? ), which was fenced off from climbers, so we couldn't even go up. After resting at the hostel for a bit, then headed out for the evening. We went to a hookah bar just a block away. It was crowded and breezy by the riverfront, which isn't exactly the best conditions for hookah. After a bout of indecisiveness and comparing menus at nearly every restaurant in town, we settled on an chain Irish pub (O'Neill's) for our dinner. I felt special: It was the bartender's first night working there, and I was his first customer ever. Cheers indeed! The burger I ordered was okay, good by British standards. My classmate didn't even get her drink order, so she was a little less impressed than I was. Then we checked out a nearby bar that advertised karaoke. We were in a singing mood, so we headed down to the downstairs karaoke area. It turned out to be a small room packed with people who were dressed up as bunnies, and there was a cheap "DJ" with a flimsy karaoke system. It also smelled really bad. So we left. We wandered around a bit before ending up at another Irish pub that had live music. We got our drinks and sat down. Traditional Irish folk music in a cozy environment lightened the mood. A group of Asian tourists were sitting next to us, and the man sitting next to the three of us awkwardly struck up a conversation. He had a really thick Japanese accent, and he clearly had already drank several drinks, so there was no way that our conversation would be intelligible conversation with him. He was overwhelmed and amazed that we were American, though. "YOU FROM AMERICA?!?!? ", he drunkenly exclaimed. The girls (and I) began to feel even more uncomfortable, so we soon left. We didn't really find anyplace else to go for the night. It was weird; most of the pubs and bars had nightclub-like bouncers, and many were closing early. It was really disappointing and definitely contrasts with the nightlife in London. It was also getting chilly, so we just headed back to the hostel and called it a night. We awoke to the sound of obnoxiously loud music blasting through the hostel door. Grumbly, we washed up and had breakfast (i.e. cereal and peanut butter and jelly sandwiches), which was served on the hostel's pool table. We checked out of the hostel and walked around to the northern side of town. There were cute houses and shops, and more university buildings. 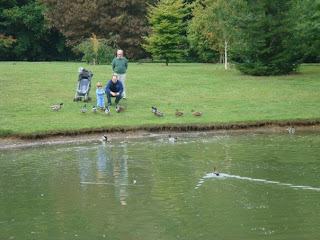 Our path led us to the university gardens, a huge swath of open park space surrounding much of Oxford. It was serene that misty morning, with many ponds, rivers, grassy fields, and trees. We ended up walking through the park and down a narrow path that led us past some football fields and into a suburban neighborhood. We followed signs and our instinct back to town and familiar surroundings, which took a while: We had walked at least a mile out of town. Soon we were on our bus back to London. I wanted to get back early for a job fair at Sainsbury's running until 6 pm (turns out, when I got there, so many people had shown up in the morning session that they ended the job fair early! What luck!). One of the girls had lost her return ticket, so she had to buy a new one, costing her an additional £8. We got back to Victoria station, and discovered that the District and Circle lines of the tube were closed for the weekend. So we had to transfer. But so did everybody else in London, it seems. The tube was packed. Jam-packed. Wall-to-wall. It was stifling, too. It was definitely not a pleasant experience.